In Part 3 of our Cannabis Plant series, we discussed the role of terpenes when consuming medical marijuana. Cannabinoids — this week's topic — are the secret to the cannabis plant's medicinal and psychoactive properties. Broadly speaking, cannabinoids help cells communicate more effectively. 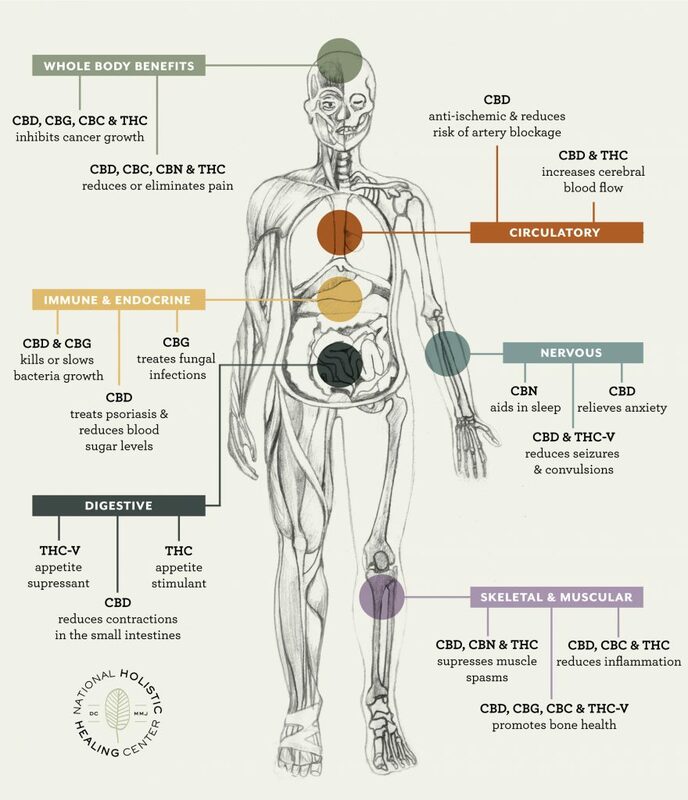 Cannabinoids work by imitating endocannabinoids — compounds which our bodies naturally produce to maintain immune stability and general health. Without it, we are more likely to experience health complications. There are dozens of cannabinoids present in cannabis, though most of them are found at low levels. The two main cannabinoids that patients are familiar with are THC and CBD. Unlike THC, however, CBD is non-psychoactive. Together or apart, THC and CBD may relieve a wide variety of symptoms such as pain, anxiety, nausea, and inflammation. To produce THC and CBD, the cannabis plant synthesizes eight main cannabinoid acids, which can only be decarboxylated, or ‘activated,’ by heat. Once decarboxylated, cannabinoid acids such as CBGA, THCA, CBDA, and CBCA become neutral, which produce cannabinoids such as THC and CBD. Without be decarboxylated, cannabinoid acids alone have no psychoactive effects, but they do have unique properties such as antibiotic or insecticidal effects. 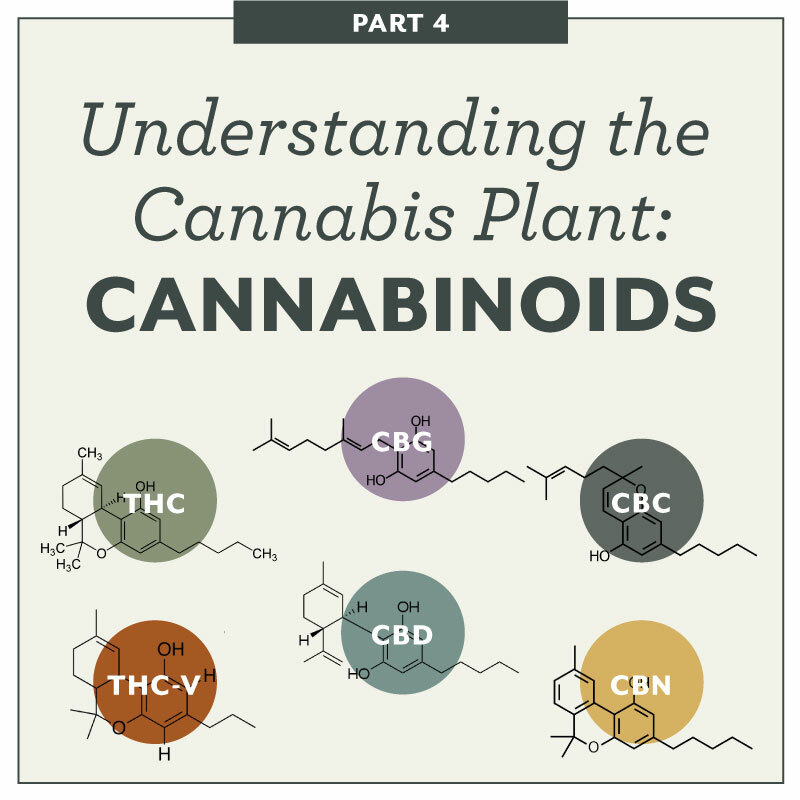 Below, we break down some of the most prominent and known cannabinoids and their specific uses. THC is the main psychoactive component of cannabis. Depending on the amount found in various strains, patients feel effects such as elation, sedation, energy, hunger, laughter, dizziness, or relaxation thanks to THC. Though it can lead to red eyes, dry mouth, or anxiety, it is often found to help with PTSD, Crohn’s disease, ADHD, sleep apnea, appetite loss, and inflammation, among many other conditions and ailments. CBD, unlike THC, is non-psychoactive and instead, provides inflammatory relief and pain relief. It can also help with multiple sclerosis, opioid withdrawal, and epilepsy. Charlotte’s Web, a strain high in CBD, was created for and named after a young girl with severe epilepsy who found relief with cannabis. Its high CBD content and little to no psychoactive effects are ideal for young patients, as well as those who wish to remain fully functional and clear-headed for day-to-day activities. The benefits of CBC are mostly found when used in conjunction with other cannabinoids. This is known as the entourage effect: the synergistic effects are greater than the sum of their parts. CBC is useful for treating symptoms associated with cancer, pain, acne, and depression. It has also shown to have a positive effect on brain cells that maintain brain homeostasis, which leads to decreased risk of neurological ailments. CBG is the chemical parent of THC and CBD, but is present at levels below 1% in the average strain. Similarly, THCA, CBDA, and CBCA, are all derived from CBGA. CBG reduces pressure in the eyes, and is therefore thought to be effective in treating glaucoma. In scientific studies with mice, CBG was discovered to help neurons resist degeneration and to fight the growth of cancer cells. Other research has showed promising results in muscle relaxation and stimulating appetite with CBG. THCV is another cannabinoid that is similar to THC in molecular structure and psychoactive properties, but has unique effects. Unlike THC, THCV is known to actually suppress appetite. Patients that are focused on weight loss afraid to develop the "munchies" with cannabis should look for strains or products high in THCV. Additionally, scientific research in Israel determined that this cannabinoid has the capability of treating PTSD and anxiety disorders, as it suppresses a individuals "panic mode" in response to threats. Cannabidiol, or CBN, is a cannabinoid most popularly known for its effectiveness in treating insomnia. According to Steep Hill Labs, 5mg of CBN is as effective as 10mg dose of diazepam, a pharmaceutical sedative. This particular cannabinoid also serves as an anticonvulsant and anti-inflammatory. CBN, like many other cannabinoids, offer an alternative to THC for patients seeking treatment without psychoactive effects. When you visit us at National Holistic, our knowledgable team members can help you determine which strains and products are most suitable for your needs. We're always happy to help our patients choose medicine that contains the perfect ratio of terpenes and cannabinoids for your desired experience!